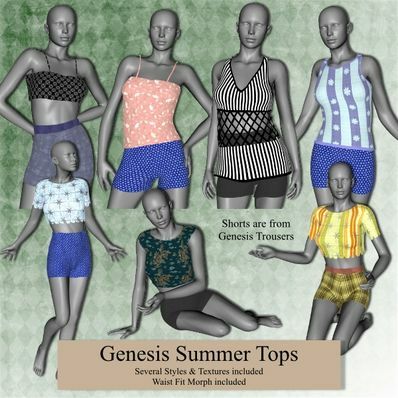 Summer Tops for Genesis for use in Daz Studio 4. 4 Styles of top with several textures & styles. Will work with most poses and shapes. I have included a Waist/Hip Fit Morph so they can be worn over shorts etc. The variety of styles, the different MAT zones, the Waist/Hip Fit Morph are just fabulous. thank You so much.